A couple of months ago, I attended a press event given by heidi klein swimwear, which was held to reveal their High Summer '14 Collection and their new My Body line of swimwear. It was a wonderful opportunity to see the collection up close. Each piece was lovely and I wanted one of everything :-) If you missed that post, you can read it here and you can also see some of the beautiful designs. Now there is more news from heidi klein swimwear. They have very recently opened a pop up shop in the Covent Garden area of London. The shop is 1,000 sq. feet and is located at 29 Floral Street, Covent Garden. It will be open throughout the summer months. If you live in London, anywhere in the UK, or if you'll be visiting London, the heidi klein pop up shop is well worth a visit. They are the authority on perfect fitting, luxurious swimwear and will help you pull together a beautiful look for your summer getaway. The pop up shop carries the style influences of their Chelsea and Westbourne Grove boutiques in that it evokes the feeling of chic oceanfront enjoyment. 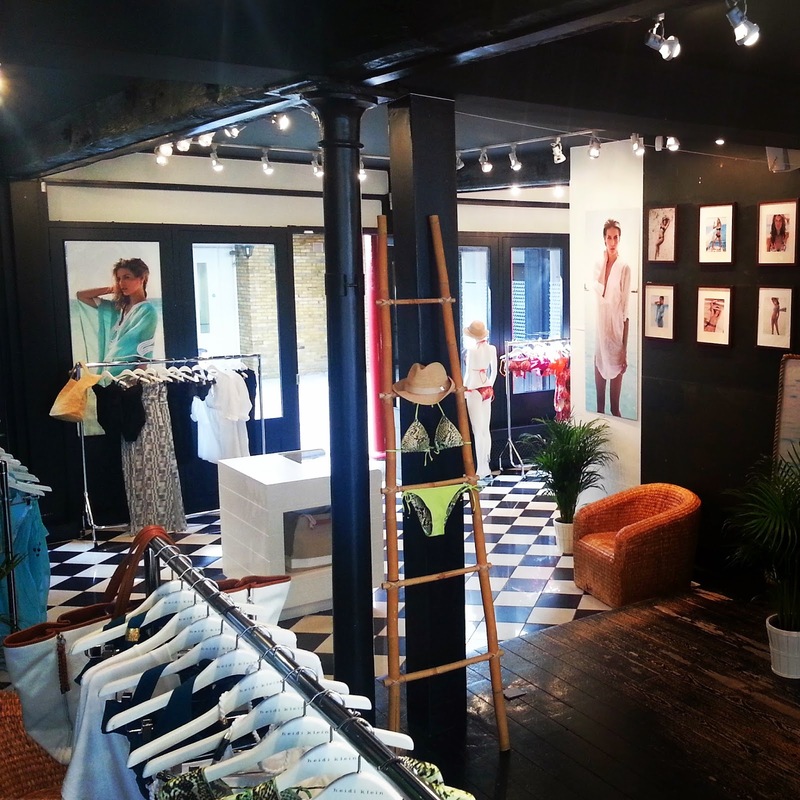 "We wanted to offer the same exclusive shopping experience found at our other London boutiques." The Summer 2014 heidi klein collection is fresh and elegant and features classic nautical prints as well as bold color harmonies. There's something for a variety of tastes in the form of swimsuits and cover ups. And heidi klein also has a wonderful array of colorful mix and match bikinis. The pieces are well-made and offer great support and fit, so a woman can feel good and look good as she goes off on her summer holiday. Shoppers are invited to stop by for a complimentary personal fitting on swimwear and receive a free heidi klein beach bag on orders over £200. If you tag a picture of yourself on Instagram @heidikleinswim wearing a heidi klein bikini, you could win a gorgeous heidi klein bikini of choice.